Atlas Gallery is immensely proud to announce the exhibition of the world’s only oversized vintage print of Route 66, Albuquerque, NM, 1969 by Ernst Haas at this year’s edition of Paris Photo, 8-12 November, at the Grand Palais in Paris. 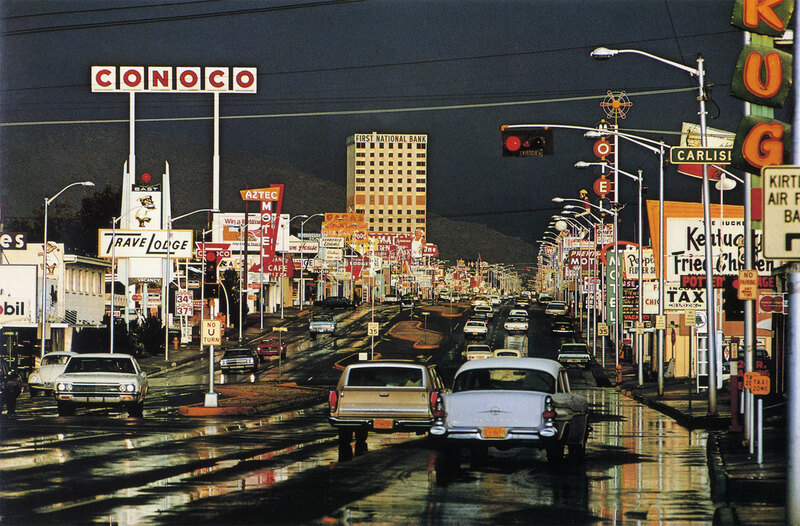 Ernst Haas loved Route 66, Albuquerque, New Mexico, 1969, which he took while driving through Albuquerque with his girlfriend. There was a thunderstorm and stopping the car was dangerous, but Haas had to capture the sudden light and begged her to stop the car. His colour-drenched Route 66 draws the eye into jagged puddles of colour, reflections of billboards and neon. The water oozes into all of the bumps and imperfections in the asphalt and reflects back the glowing neon lights of the city. Route 66, Albuquerque, takes this desert town swollen with gas stations and motels and gives it a newfound, rain-washed brilliance which made it Ernst Haas’ most iconic work. With its speeding cars and myriad of drive-through restaurants signs the image has become a symbol of the automobile culture and of America’s golden years. The print was made in the mid 70’s for an exhibition in New York, and was then hung in the photographer’s living room for decades and passed down to his family. This is the only print of Route 66 produced in this size; we are delighted to be offering such unique vintage and oversized dye-transfer print with exceptional provenance, which appears on the market for the first time. Tickets for Paris Photo are available at www.parisphoto.com. Please contact info@atlasgallery.com for further information.